If you know your case is going to trial, you need more than a litigator. You need a trial lawyer. 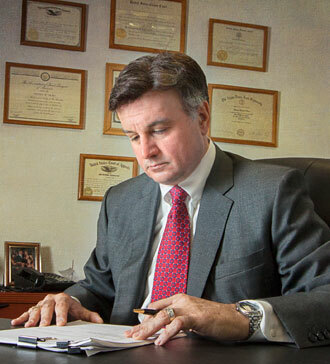 At the Law Offices of Thomas R. Nigro, we have the experience and perseverance it takes to get the job done right. This guy is a bull-dog! Have used him for various business and personal matters over the past few years. He is a very knowledgeable experienced litigator. Recently, I retained him to try our case before a jury on a civil matter. This guy is a very detail oriented bull-dog! Every lie was exposed as he essentially pulverized the testimony of the defendants. In the end, he literally had them begging and crying to settle. He exceeded my expectations and justice was fully served. Mr. Nigro was nothing short of brilliant in unraveling an accounting nightmare in my case. His persistance paid off. Highly recommended!! Thomas Nigro was nothing short of brilliant in his pursuit of justice on our behalf. From discovery to depositions…and ultimately trial, he brought his “A game”. The end result, lies we’re exposed and justice served. HIghly recommend!!!! Mr. Nigro is not only effective in his representation –but ethical. I highly recommend his services! I have known Tom Nigro for more than 30 years and have worked in the same office both early in his legal career and currently. I have seen his exemplary legal work in and out of Court and at trial, his care for his clients and the detailed analysis he puts into every case. Tom is a premier advocate and trial attorney and an outstanding lawyer in our community. His expertise has been relied upon by me and many of his colleagues and clients. Tom’s standard of professionalism is the epitome in his legal practice. Without any reservation, I recommend Mr. Nigro. Tom Nigro is, and has been an outstanding lawyer in our community for many years. His expertise has been relied upon by many and his standard of professionalism is unsurpassed in his field of law. Tom is the consummate attorney at law, providing his clients with the skills and vigor one in need would expect from legal counsel. I recommend Tom without hesitation. To find out how The Law Offices of Thomas R. Nigro can help you, call today!